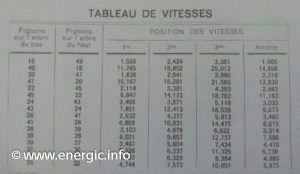 There are 2 models in the Energic type 214; model A only for rotivation ; 214 4cv (213kgs) 3,148/3,167 frs. 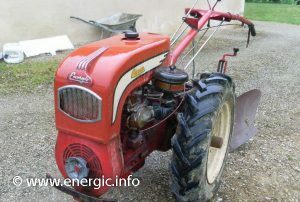 and Model B for all labour and rotivation; 214 4cv (213kgs) 3,340/3441 frs. (1/05/1963). (you do not have to take the wheels off to rotivate on this model). Engine. 4 stroke, 4cv Bernard w 110, 4cv @ 2500 rpm., Single cylinder, 4 stroke, Alésage 64mm x Course 64mm. Cylinder 206cm3, Air cooled. Cylinder head/Carter – aluminium with special metal cylinder lining. Cylinder head Hemispheric, with Over head valves (OHV). The piston is made up from a mixture of aluminium-silicon and copper for maximum resistance under load. Push rods are regular able, The Crankshaft is mounted on regulated roller bearings with sealing rings at each end giving full safety against the introduction of dust inside the casing. Centrifugal regulator. Weight. 213kgs With additional wheel weights of approx. 25kgs single or (50kgs) double. Also it is possible to fill the tyre with water for extra traction and weight. Addirional equipment. 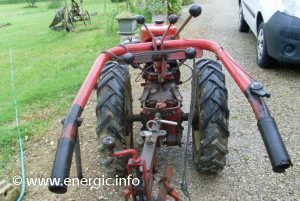 Brakes, Fully automatic wheel width regulation. 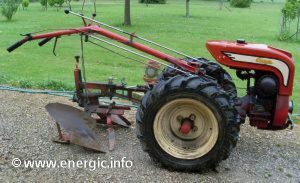 potato lifter/arrache pomme dr terre, barre de coupe 1.45m, various plows (15 – 22cms) – brabant, buttior, bineuse, charrue simlpe 3 types, bi-soc plows, cultivateurs, expirpateur 5 dents, rotivator/fraise rotaive – 350/500mm, harrow/herse, wheel weights/masses, extra sprockets in the gearbox to double the gears, poulie 110mm, various towing brackets/attelages, sprayers/ pulverisateur 100liters- pipe- 1 lance, metal wheels/roues méttaliques, seed planter/semoir, winch/treuil and various variations on wheel sizes and dimensions.